As I mentioned last week, I’ve been posting some of my favorite images from 1918 on Twitter while I regroup after spending 2018 reading as if I were living in 1918. Here’s this week’s batch. 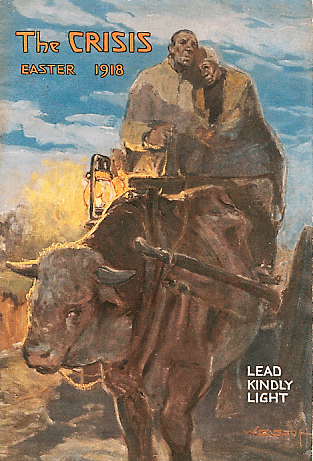 On Martin Luther King Day, I posted the April 1918 cover of The Crisis, featuring a painting by William Edouard Scott of a couple making their way to a new life in the north. The painting is now in the Huntington Museum of Art in West Virginia (although not currently on display). 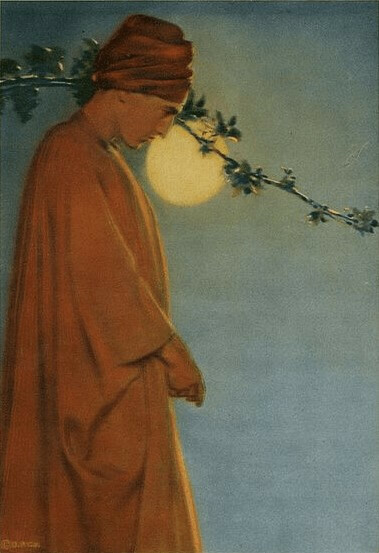 Poet George Sterling posed for this illustration in an edition of the Rubaiyat of Omar Khayyam featuring photographs by Adelaide Hanscom (later Leeson). 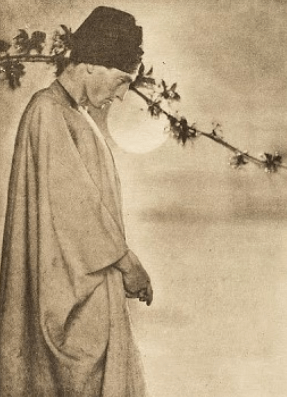 The original 1905 edition was in black and white; the photographs were tinted in a 1914 reissue. I wrote about Sterling, who founded Carmel, California as an artists’ colony and was known as the “Uncrowned King of Bohemia,” here. 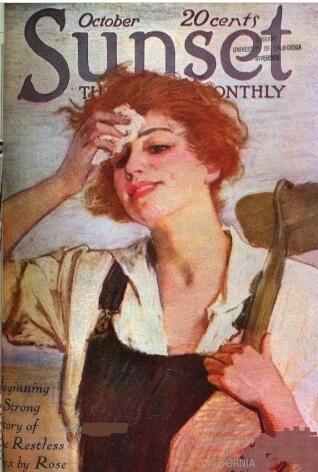 I’m intrigued by the short-haired, drop-waisted woman on the cover of the July 1918 issue of Vanity Fair. She looks like a time-traveling flapper from 1923. The artist is Georges Lepape. 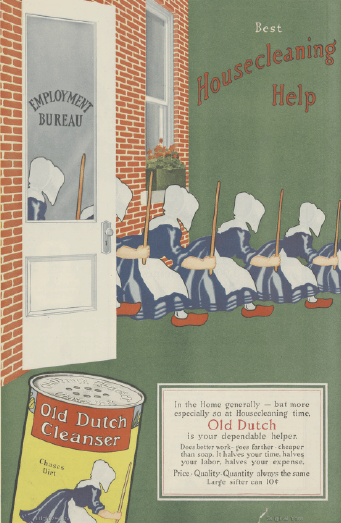 “Haunting” isn’t a word we typically associate with cleaning products, but I was haunted by the tiny cleaners in the Old Dutch Cleanser ads. Here are two of my favorites, from the February and May 1918 issues of the Ladies’ Home Journal. Women in 1918 were apparently easily startled by insects. 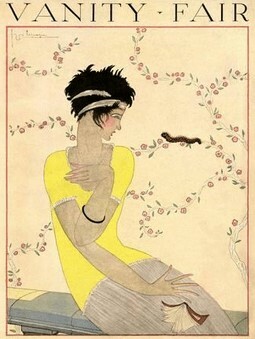 This one’s from George Wolf Plank’s cover for the August 1 issue of Vogue. I’m not a car person, but I love 1918 cars (and car advertisements). 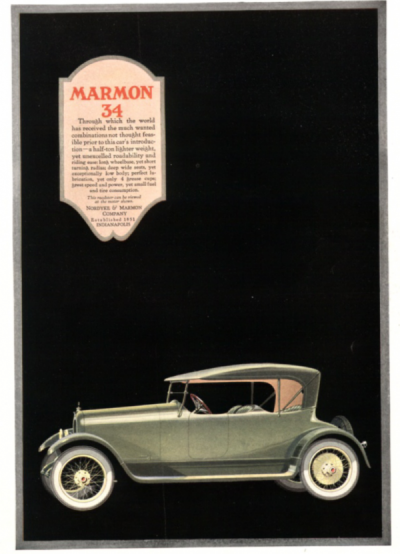 The Marmon 34 set a coast-to-coast speed record in 1916: 5 days, 18 hours, 30 minutes. This ad is from the February 1918 issue of Harper’s Bazar. 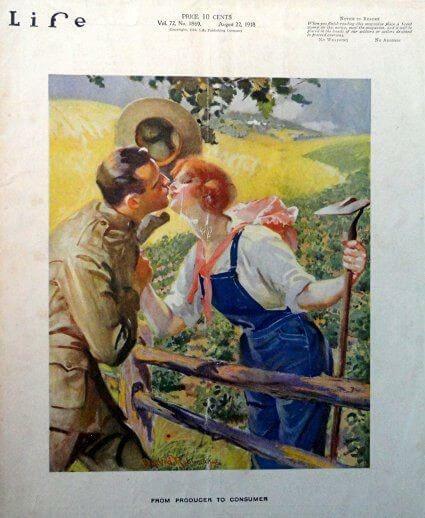 I found the word “farmerette” hilarious when I started my reading-in-1918 project, but now I see a picture of a woman in overalls and think, “Oh, a farmerette.” Italian-American painter Matteo Sandonà drew the farmerette on the Sunset cover; I couldn’t find the artist for the Life cover. Maybe I’ll be ready to move on to 1919 soon. If not, there are lots more great pictures from 1918. 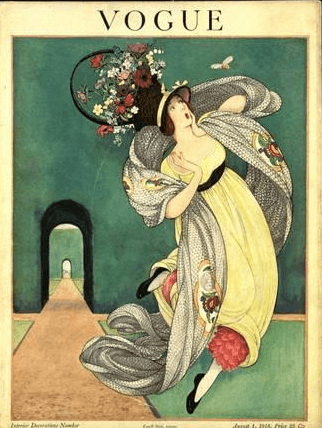 This entry was posted in Magazines and tagged Adelaide Hanscom Leeson, advertising, Art, cars, farmerettes, George Sterling, Georges Lepape, illustration, Ladies' Home Journal, Marmon, Old Dutch Cleanser, The Crisis, Vanity Fair, Vogue, W.E.B. Du Bois, William Edouard Scott on January 27, 2019 by My Year in 1918. Yes, the Old Dutch cleanser creatures! Is it the hoodies hiding their faces. Are they chromatically disguised little death angels hiding skeletal visages? Is that a benign stave they wield, or a Zen monk’s chastising rod–or are we seeing a harvester of souls that has lost or concealed their scythe blade? 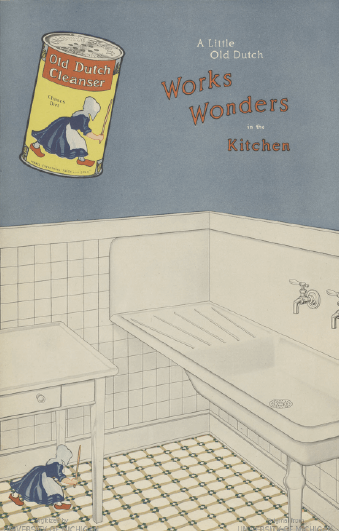 Must I overcome my fear of death and chthonic creatures in order to clean my kitchen? Of course I love the Vogue cover 😉 Beautiful images!